In order to combat the deleterious effects of the sedentary lifestyles favored by modern youth, President Putin has suggested that reinstating the Soviet-style GTO physical program could be one solution. Schools and politicians have responded favorably to the idea, although some officials want to make sure that standards remain flexible. With more and more kids becoming hooked on computers and TV, the Russian government is concerned about the health of the younger generation. Physical education has been losing ground to its competitors — TV, computers and the “sedentary lifestyle” in general — in the struggle for kids and teenagers' leisure time, stated President Vladimir Putin during a meeting on the development of youth sports. The GTO mass physical training program — which means “Ready for Labor and Defense” — was introduced in 1931 to “enhance the physical education and readiness for mobilization of the Soviet people, primarily the younger generation...” The physical education program was designed for Soviet educational, professional and sports organizations, and covered people ages 10–60. The GTO program included gymnastics, long- and middle-distance running, high jump, long jump, throwing (discus and javelin throwing, shot putting, etc. ), swimming, ski racing and shooting (for males only). Those who passed the tests were honored with special gold or silver GTO badges, depending on the performance. For a 25 –year-old male to earn a GTO badge, for instance, he had to run the 100 meters (328 feet) in 13 seconds and swim 100 meters in 1.5 minutes. According to Putin, two-thirds of Russian children develop chronic diseases by the age of 14, and half of all pupils show signs of disorders with musculoskeletal development. To overcome this negative trend, Putin believes that Russia has to reconsider its approach to physical education; it needs to build it into a comprehensive and effective modern system. 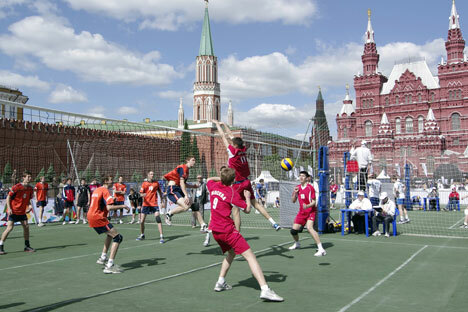 Russian schools welcomed the idea of reinstating mandatory physical-training tests. As Pavel Karpov, head teacher at one of Moscow’s schools, told Gazeta.ru, “it is natural to expect the government to impose requirements on its future citizens,” and general physical fitness does not hurt anyone. Politicians agree. “As far as national health goes, the idea is absolutely right,” Alexander Degtyarev, head of the State Duma committee on education, told RIA Novosti. “This is a message to society that sports mean a healthy lifestyle and meeting global standards for success,” former athlete and current Federation Council (the Russian parliament's upper chamber) member Viacheslav Fetisov told RIA Novosti. According to Fetisov, being involved in sports from an early age can help kids develop a strong aversion to both alcohol and drugs by the age of 12. “We need a healthy nation; this will pave the way to a healthy economy and success in achieving the objectives we have set,” he said. Meanwhile, the system of physical evaluations for children must take medical conditions into account. “We can’t overtax kids and cause heart attacks; we need to have a system of guidelines,” Putin said. According to Moscow children’s rights ombudsman Yevgeny Bunimovich, the physical health and development of children is a very important issue that has been all but neglected in Russian schools.